Continuing with my series here on standard business plan financials, all taken from my Lean Business Planning site, the Profit and Loss, also called Income Statement, is probably the most standard of all financial statements. 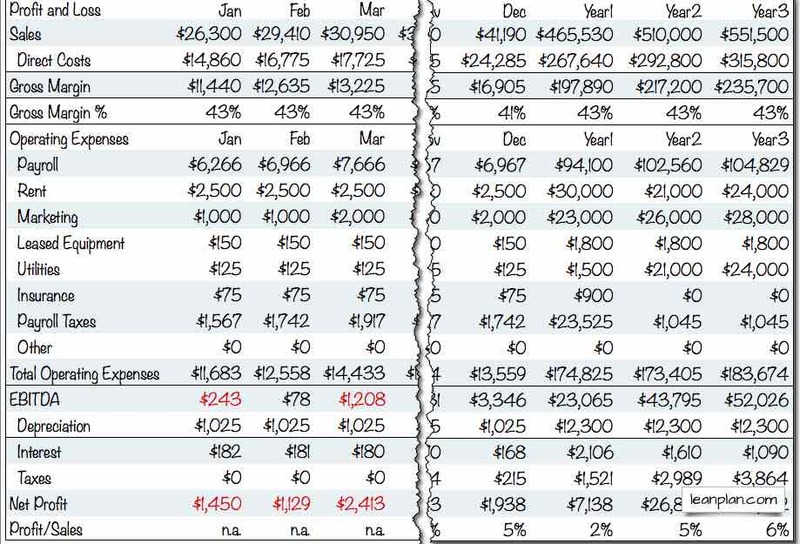 And the projected profit and loss, or projected income (or pro-forma profit and loss or pro-forma income) is also the most standard of the financial projections in a business plan. Either way, the format is standard, as shown here on the right. It then shows Direct Costs (or COGS, or Unit Costs). Then Gross Margin, Sales less Direct Costs. 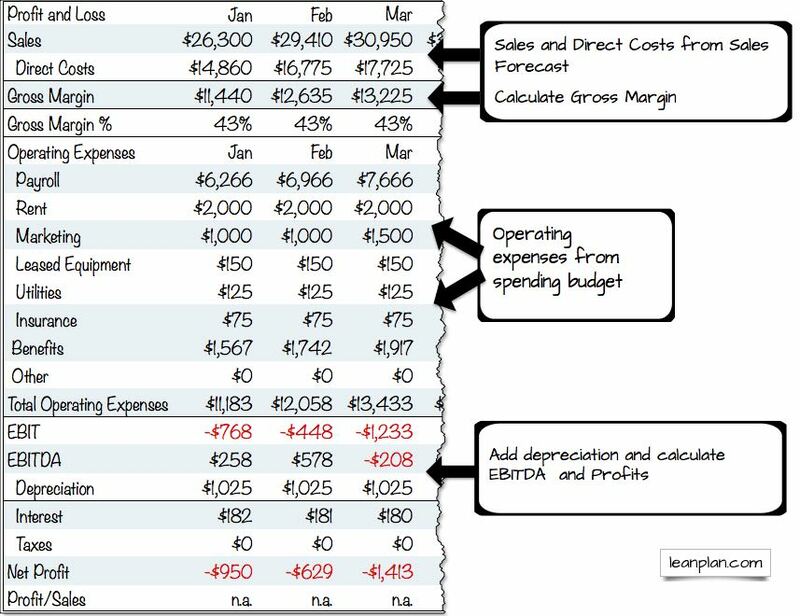 Gross margin less operating expenses is gross profit, also called EBITDA for “earnings before interest, taxes, depreciation and amortization.” I use EBITDA instead of the more traditional EBIT (earnings before interest and taxes). I explained that choice and depreciation and amortization as well in Financial Projection Tips and Traps, in the previous section. Then, at the very bottom, Net Profit; this is why so many people refer to net profit as “the bottom line,” which has also come to mean the conclusion, or main point, in a discussion. The following illustration shows a simple Projected Profit and Loss for the bicycle store I’ve been using as an example. 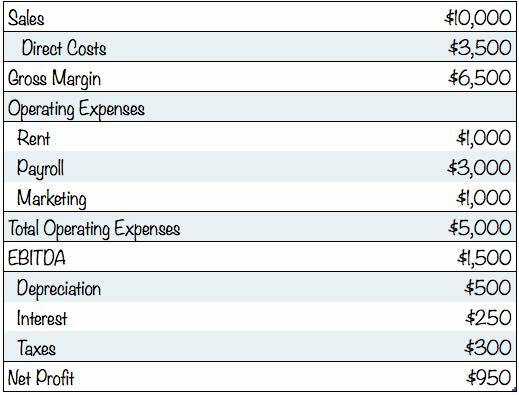 This example doesn’t divide operating expenses into categories. The format and math start with sales at the top. You’ll find that same basic layout in everything from small business accounting statements to the financial disclosures of large enterprises whose stock is traded on public markets. Companies vary widely on how much detail they include. And projections are always different from statements, because of Planning not accounting. But still this is standard. 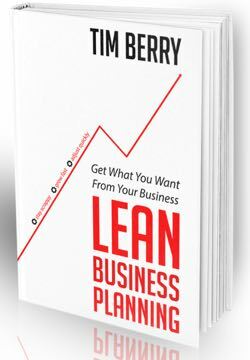 A lean business plan will normally include sales, costs of sales, and expenses. To take it from there to a more formal projected Profit and Loss is a matter of collecting forecasts from the lean plan. The sales and costs of sales go at the top, then operating expenses. Calculating net profit is simple math. Keep your assumptions simple. Remember our principle about planning and accounting. Don’t try to calculate interest based on a complex series of debt instruments; just average your interest over the projected debt. Don’t try to do graduated tax rates; use an average tax percentage for a profitable company. Notice that the Profit and Loss involves only four of the Six Key Financial Terms. While a Profit and Loss Statement or Projected Profit and Loss affects the Balance Sheet because earnings are part of capital, it includes only sales, costs, expenses, and profit. Excuse me, may I know if the project profit & loss should plan for the first year only or for year 1-3 in business plan of a new company? Kattie Wan, I recommend for normal cases the projected profit and loss monthly for the first 12 months, and two years annually after that. There are always special cases, though; every business is different.